Depending on your point of view you may find the Peruvian delicacy of roast guinea pig as a horrid way of treating our squeaking furry friends or just another local speciality to try. My friend Joanne decided to keep an open mind and give it a try on her trip to Peru. 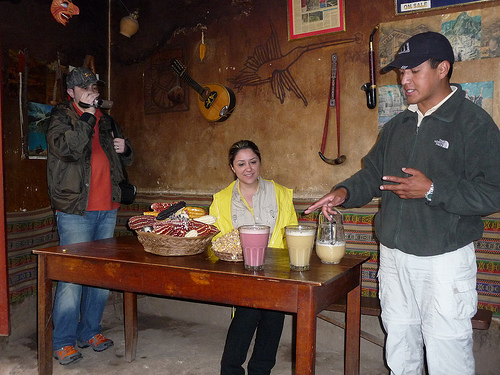 In the town of Aguas Calientes, where Joanne was staying before her visit to Machu Picchu, the group stopped at the house of one of their guide’s relatives who had been brewing Chicha, the local maize beer. Apparently the chicha only keeps for a few days and so the villagers take it in turn to make the home brew, putting a red rag or plastic bag on a pole outside to let passers by know that it’s ready. Joanne tried both the red maize chicha which she thought tasted of strawberries and the yellow maize chicha which she found less appetising - the texture was a bit like an alcoholic smoothie. As they were leaving the house, Joanne heard squeaking coming from the other side of the courtyard and when she enquired where the noise was coming from, was shown two stables full of guinea pigs running around. 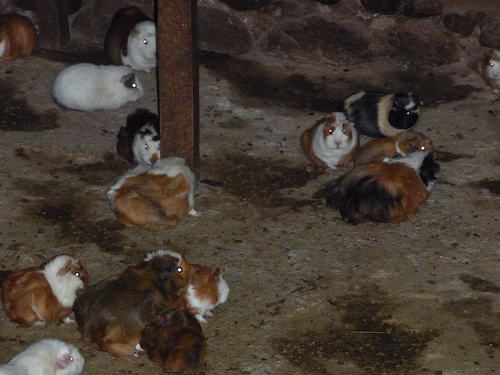 The first was full of fat little mummy guinea pigs, either pregnant or with their babies. The second stable was where the the guinea pigs were moved to fatten up before being sent to the great cooking pot in the sky. Have you ever been to the hotel that time forgot?